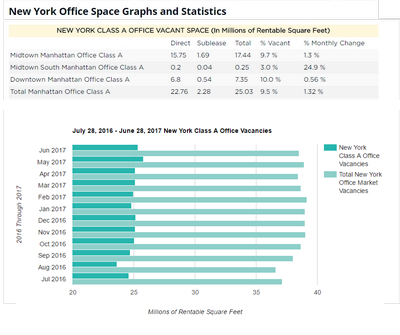 The amount of leased in the fourth quarter of 2007 was 34.5 % lower than the amount of leased in the fourth quarter of 2006. Average asking rents fell by 45 cents to $61.46 per square foot in the fourth quarter, down from $61.91 per square foot in the third quarter. 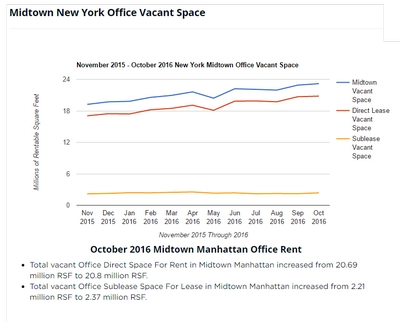 In 2007, the office market in Downtown Manhattan had a lower overall vacancy rate than the Midtown market for the first time since 2001. 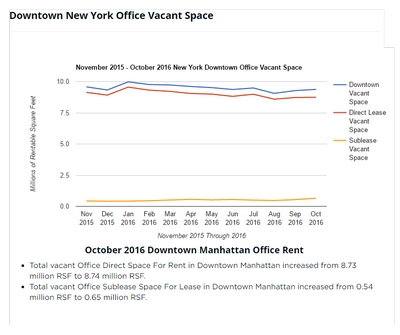 The year-end report showed that Downtown had a 7.6 percent vacancy rate last year, compared to a 7.7 percent rate in Midtown. 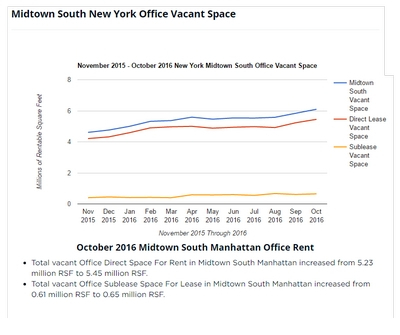 Downtown saw 412,108 square feet of office leasing activity in the fourth quarter of 2007, which include two major relocations from Midtown: Omnicom's 180,000-square-foot lease at 195 Broadway and American Lawyer Media's move to 120 Broadway. 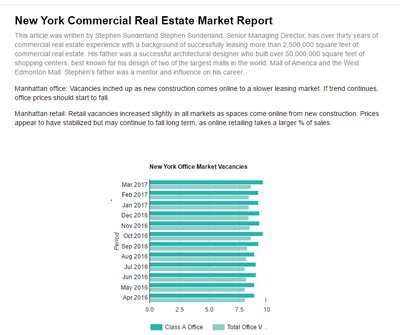 SJP 11 Times Square at Eighth Avenue and 42nd Street has 1.1 million square feet to rent. The Port Authority's One World Trade Center, (the Freedom Tower) has around 1.6 million remaining (2 government agencies are taking about 1 million square feet in the 2.6 million-foot Freedom Tower). In addition, Larry Silverstein will start on WTC Tower 4, which will add another 2.3 million square feet for delivery in 2011. The Port Authority and the city plan to take about two-thirds of it for their own office use. Boston Properties' 1 million square-foot office Eighth Avenue tower between 54th and 55th streets, aka 250 West 55th Street. Law firm Gibson, Dunn & Crutcher has signed a lease for 220,000 square feet, while another law firm is expected to take between 500,000 and 600,000 square feet. Brookfield announced that it is out of the running to develop Hudson Yards. The developer will still be active in the neighborhood. Just east of the West Side Rail Yards, Brookfield will build two large office towers. Related Companies and the Hudson Companies released renderings for two proposals for the polluted Public Place site along the Gowanus Canal in Carroll Gardens where they will build more than 700 units of housing and retail and parkland. Toll Brothers has revealed plans for its big development along the Gowanus Canal: 577 residential units are planned, including 130 affordable units, along with 2,000 square feet of community space, 2,000 square feet of retail and a waterfront esplanade. The buildings will be four to 12 stories and the tallest structure will be 125 feet. Developer Shaya Boymelgreen put the four-acre Gowanus Village site back on the market asking $27 million. Luxe waterfront condos have been planned, which has 470 feet of Gowanus Canal frontage. 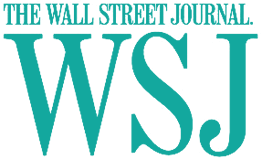 Goldman Sachs Group Inc. and Lehman Brothers Holdings Inc. haven't dodged the credit crisis. The new source of potential losses: so-called variable interest entities that allow financial firms to keep assets such as subprime-mortgage securities off their balance sheets. VIEs may contribute to another $88 billion in losses for banks caused by the collapse of the housing market. Goldman, which hasn't had any of the industry's $163 billion in writedowns, said last month it may incur as much as $11.1 billion of losses from the instruments. Willets Point a controversial site in Queens could be the home of a new convention center. The public review process is to begin for Willets Point, and the city's ambitious plans call for a convention center with up to 400,000 square feet. Plans also call for 5,500 housing units, 1.8 million square feet of retail and 500,000 square feet of office space. Moynihan Station may topple before it gets off the drawing board. Funding has fallen $1 billion short of its $2.3 billion projected cost. Amtrak has yet to give the go-ahead for the plan or okay the name change. 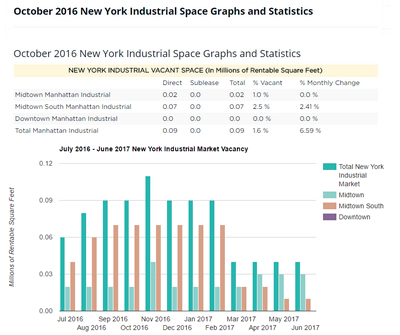 Hudson Yards and the Moynihan Station are in danger of dying from uncertain funding, risky financing and lack of coordination. Despite billions spent by the city, state and developers on studies, land acquisition and architects, no one has figured out who or how it will be paid for. The Hudson Yards: the city's name for a planned new district west of 10th Avenue, complete with office and residential towers, parks and its own subway stop on an expanded No. 7 line. The 33-acre district, much of it over the rail yards, was rezoned in 2005, and the five developers picked by the city are to submit revised proposals in a second round of bids. Expanding the No. 7 line is crucial to the success of the new neighborhood, but the project already has been scaled back to cut costs. The city puts the cost of the expansion at a low $2.1 billion - a figure it set in 2003 and hasn't adjusted for todays skyrocketing construction costs. The MTA considers the proposed Second Avenue subway line a greater priority and has refused to pick up the tab. A $1.1 billion tunneling contract has been awarded, but to save an estimated $450 million, the city abandoned plans to put a station at 41st Street and 10th Avenue. The line will run from 34th Street and 11th Avenue without a stop - a decision that "puts at risk several million square feet of potential commercial and residential development" in the Hudson Yards. 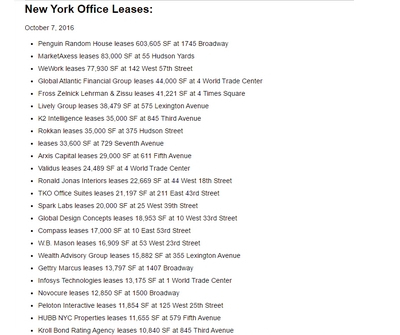 If builders lose interest, New Yorkers could be saddled with billions in debt. The city is funding the project from the sale of $2 billion in bonds. Interest from the bonds is payable from city appropriations; the principal will be met by revenue from payments in lieu of taxes by developers. 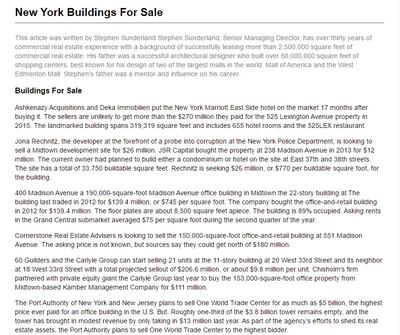 GM Building Sale. Cayre, founder of Midtown Equities, is in talks with developer, Harry Macklowe, in a deal that would allow Macklowe to retain a management and minority partner position in the General Motors Building. Cayre, a co-owner of the Sears Tower, and his Middle Eastern backers have the upper hand because they will buy out Macklowe's creditors. Macklowe needs to sell the Fifth Avenue building for more than $3 billion. He is past due on short-term loans that he took out on the seven office buildings he bought last year for $6.8 billion. Cayre would buy out Fortress, the holder of a Macklowe's $1.4 billion bridge loan. John Catsimatidis decided not to proceed with a Downtown Brooklyn project on Myrtle Avenue where he was going to build a 660-unit tower rise. John Catsmatidis citied the credit crunch and a lack of financing for the affordable housing component. Other builders are examining their options as financing becomes harder to get. Investors have shown less interest in buying low-income housing tax credits. 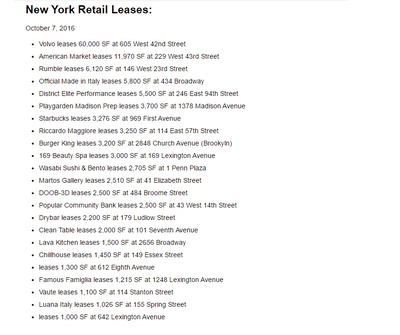 Mayor Michael Bloomberg has threatened to foreclose on 24,593 New York City properties if the owners don't pay their share of the $470 million in unpaid property taxes and water bills. Property owners will be notified that they have 90 days to pay off the debt, ranging from $1,000 to millions of dollars. 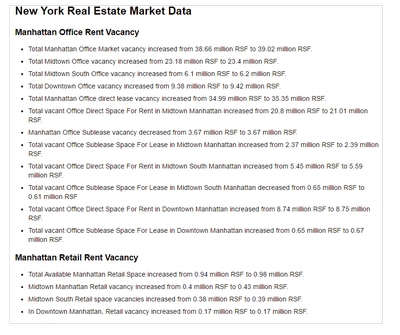 The commercial and residential properties are scattered throughout the five boroughs. The city sent out similar warnings in 2006, though only 6,640 property owners were notified at that time. 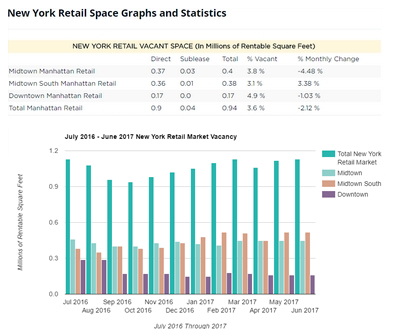 The Department of City Planning proposed the creation of a "special purpose district" ranging from 124th to 126th streets, between Broadway and Second Avenue. It would create 1.8 million square feet of office, retail and hotel space, and 2,500 new residential units, including 500 units of affordable housing. The proposal has won approval from two community boards, but was voted down by another. The city must complete its review by March 10. The new rezoning will bring both new mixed-use development and cultural institutions. After three years, the state selected the Danforth Development Partners to redevelop the Victoria Theater, which will house the Jazz Museum, the Classical Theatre of Harlem and the Harlem Arts Alliance in addition to a hotel and condominiums. 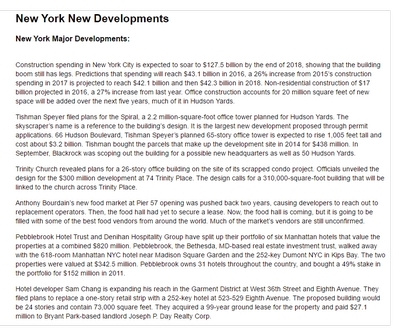 Vornado Realty Trust and MacFarlane Partners took over plans for th Harlem Park project on 125th Street and Park Avenue where they have unveiled plans that would offer 540,000 square feet of Class A office and 90,000 square feet of retail. Major League Baseball and Inner City Broadcasting, a radio network, were negotiating with Vornado for space. Vornado is pushing for the city to lift its proposed height requirement. If the project gets built, it would be the first major office building on 125th Street in about 40 years. Joseph Rose, the former director of City Planning in the Giuliani administration, is planning a hotel of more than one million square feet at 260 12th Avenue, a block south of the Hudson River Park. Rose's Georgetown Company is planning a 66-story, 828-foot hotel on the site. Developer Durst is planning to build a $200 million-plus private school (the Nations Academy) at 623 West 57th Street, a block from the Hudson River. The Durst Organization, which has a long-term lease on the block, will build the 240,000 square foot school. The cost of the New York Yankees new stadium may reach $1.3 billion, up from an earlier estimate of $930 million. Another $135 million will be needed for bringing in concessions. The team will pay the extra costs. The city and state are paying for new parks, new garages and a new Metro-North station. The Yankees say they rejected offers of at least $50 million a year for naming rights. Much of the interior steel structure is complete. The 2nd U.S. Circuit Court of Appeals has allowed the $4 billion Atlantic Yards project to go forward. Opponents have endured a series of legal setbacks recently. A lawsuit last month that challenged the state's environmental review of the project was rejected. The plaintiffs are said to ask the U.S. Supreme Court to hear the case.